South Newman Primary School is a SunSmart School. We aim to protect our students, staff and visitors from ultraviolet (UV) radiation, which can lead to skin cancer later in life. We are SunSmart whenever the UV Index is 3 or above. This includes for camps, excursions, sporting events and outdoor lessons. We know that UV is not the same as heat and we can get sunburnt on cool days when the UV is above 3. Sun protective clothing is part of our uniform. We encourage use of SPF 30 or higher broad spectrum water resistant sunscreen. Everyone wears a broad brimmed hat when outside. We know caps are not adequatley protective. If we don’t have a hat, we can borrow one or play in the shade. 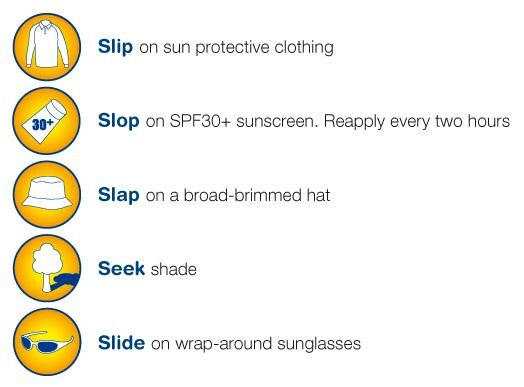 Staff and visitors are requested to role-model good sun protection by wearing a hat. We provide shade for play, outdoor lessons and events. We learn about skin cancer prevention. When we can, we schedule outdoor activities when the UV is lower.